Alongside our weekly in-gallery curator “One on One” talks, we post regular ‘one on one’ bits from curators & staff on a particular work or exhibition they’re interested in. Follow the series here. Today’s post is actually a little bit two-on-one: Jill Sterrett, SFMOMA director of conservation and collections, & Sarah Roberts, associate curator of collections and research, who will be pinch-hitting for Jill’s Thursday evening tour. I have a memory from the 1960s. It’s an astronaut in a picture-pastiche in Life magazine that caught my eye. I came to learn later that this fold-out spread by Robert Rauschenberg was commissioned by Life to commemorate Dante’s 700th birthday. Back then, I didn’t know Rauschenberg, I hadn’t yet learned who Dante was, and I certainly missed the full impact of Rauschenberg’s references to a modern-day inferno. 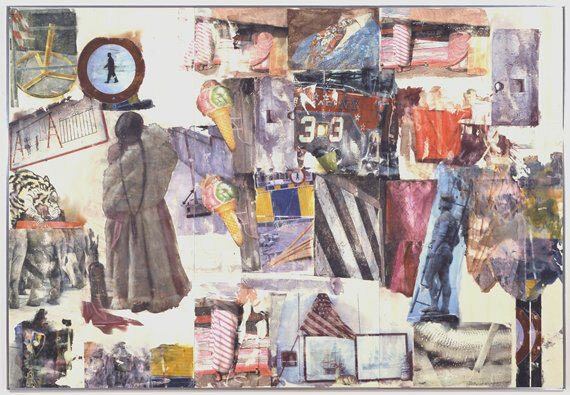 Still, the fresh forces of youthful curiosity and discovery in that unknowing moment seem to me quintessential Rauschenberg, and they are all present in Port of Entry (1998). The work is made using Rauschenberg’s transfer process, a process that was vital to his career. In Port of Entry, the figures face something in front of all of us, something beyond the “view from here”-and yet pedestrian signage and physical barriers abound. Some forms emphatically repeat and others are almost unrecognizable. This past May, a blogger highlighted Port of Entry as a favorite because it tells stories (“Check out the tiger, the peace wheel and the ice cream cones”). Rauschenberg called upon the everyday, working famously in the gap between art and life. For Rauschenberg, there was no reason not to consider the world his palette. His claim to this idea of art made for a liberating, open-ended proposition that flowed through every aspect of his work, from subject to materials to methods. Indeed, it’s what inspired that urge I felt back in the 60s to know not only how he made that Life spread but to give that method of picture-making a try. Such is Rauschenberg’s boundless proposition on art: anything is possible. This is Sarah writing now—Jill asked me to sub for her One-on-One talk on Rauschenberg because I’m heading up a research project on the museum’s Rauschenberg collection. This particular work is one I have not spent much time researching yet, so I’m using this talk as an opportunity to dig a little deeper and just spend time looking and thinking about it. I have an odd relationship with Port of Entry—every time I go see it, I’m surprised by how small it is. Not that is it petite, mind you, but somehow it looms even larger in my mind than it actually is. Something about the expansiveness of its content and the arrangement of forms across the plane, I suppose. Perhaps that will be a good place to start the conversation. Hope to see you on Thurs. Aug. 20 at 6:30pm. And cheers to Jill on vacation . . . Fascinating info on Rauschenberg, both in subject matter and technique. I had no idea. Thanks for blogging, Sarah. What a treat to view this fine work of art…I saw it on Monday! Thank you!